Create PDF files from multiple emails of OST file in batch. Selectively Export Mails, Contacts, Calendars, Tasks, Notes, etc to PDF. Quickly scan & preview OST file items within software interface. Provides support to maintain Page orientation after exporting. Adobe Acrobat installation is not required to create PDF files. Allows users to Apply Date Filter while migration of OST to PDF. Provides support for exporting with folder hierarchy. Add Page Numbers as per required positions along with Date Stamping. The tool supports Outlook 2016, 2013, 2010, 2007, 2003 & 2000 Version. 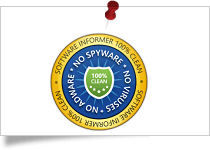 Software Informer has given SysTools OST to PDF Converter 100% secure & clean award for the best performance. 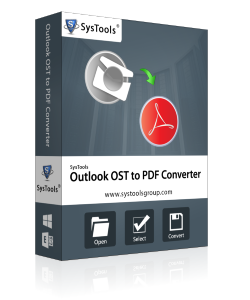 SysTools Outlook OST File to PDF Converter got 4.8 Star rating from Cnet for its well organized working. 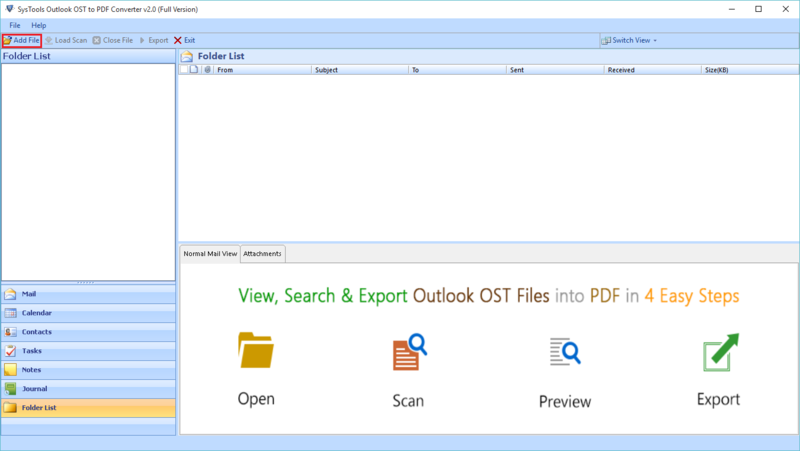 The Outlook OST file to PDF Converter allows migration of multiple OST file emails at once, into PDF format. You can save all emails from inbox, sent items, drafts and other email folders into PDF file format. Once you load the OST file, software performs a quick scanning of OST file. Also, it will generate an instant preview of all the items within the OST file. You can click on each folder and the software will load items within that folder. This OST to PDF Converter Tool provides user with facility to Apply Naming Convention on data according to Date, Subject , From etc. This will allow to sort emails as per user-defined settings within the Advanced Settings Tab. While converting from OST file, this software provides an in-built feature to implement Date Filter Option. This feature enables user to filter out the data items within OST File within specific range of date while OST files to PDF migration. While saving the emails from OST file as PDF format, you can select any desirable location on your system. Also, if you like, it is possible to make a new folder right from software panel and save the files directly into it. 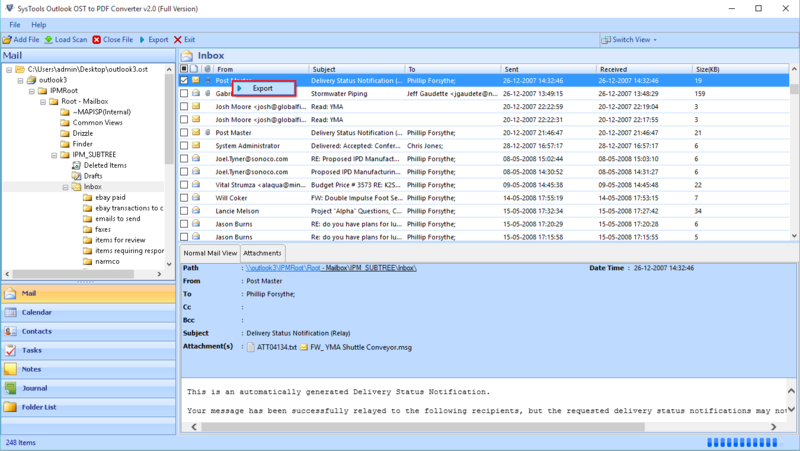 Even in the absence of Exchange Server connectivity OST emails can be accessed as PDF format. The tool retains Folder Heirarchy of the emails stored with the folders. It maintains the same heirarchy even after the converion of data items from OST file to PDF. Once the software loads and lists the OST file emails; associated properties like: From, Subject, Received Time and size in KB can be seen. Moreover, if you want you can sort the emails using these properties so as to arrange the list of order. This tool enables user to modify the PDF orientation & settings if required. It allows you to set proper PDF Margin (Top, Left Botton & Right Margin) & paper Orientation in landscape or Portrait form. User can adjust page size (Letter A4 & A3) also. This tools also ammends to implement Page Numbers as per required positions along with Date Stamping. Trial Version of OST to PDF Converter will export all OST Mails, Calendars, Contacts, Notes, Tasks & Journals into PDF format with trial limitations of 25 items per folder of OST Files. Can you please help me with the brief working of this tool? Is this software compatible with Windows 10 machine? Yes, software is compatible with the latest Windows 10 and all below versions too. Can I also convert email attachments using this tool? Software supports converting emails, attachments, contacts, calendars etc. ; into PDF format. Email attachments will be embedded within the respective PDF file in their original format. Is it possible to convert multiple OST files at once? Yes, software can convert any number of OST file one by one. Once added, then you can export multiple OST file. Can I convert an inaccessible OST into PDF with this software? Yes, software scans chosen OST file before conversion and removes all corruption issues prior to conversion. Is there an OST file size limitation within software for conversion? No, software can convert any size of OST file without confronting the user with any performance issues. Where to find converted mail attachments? Do I need to have Outlook connected to Exchange during conversion? No, OST file should be stand-alone and must be disconnected from Exchange and Outlook installation is not required for conversion. How to get Licensed Version of the software after making payment? We will send license information at the email id used while placing an order for the purchase of tool. So please use a valid or working email id while placing order. For a successful company it won't be surprising to receive such appreciation. But I wouldn't let this great opportunity slip by as OST file to PDF conversion is something that is considered very simple but involves a lot of technique. Thanks to your tool, I was able to perform a technical procedure without the complications involved. I had such an amazing experience after using OST to PDF Converter. It resolved my issue easily as it helped me to migrate OST into PDF quickly. The user interface of this software is so simple that I executed the conversion process without any hassle. I am a non-technical user and only have some basic knowledge. But, I had no idea about how to transfer OST emails to PDF format. After some research, I got this OST into PDF Conversion software and using it, I successfully migrated my entire data within minutes. I will recommend this application to everyone!